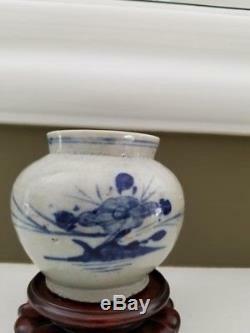 Small Korean Blue and White Yi Dynasty Jar. 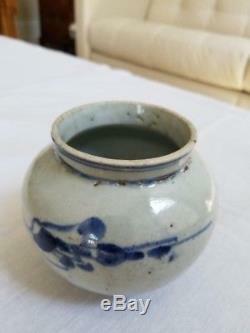 Has surface glaze cracks on the bottom of the jar, but it does NOT leak. Dimensions: 4.5" wide, 4" Height, 3" Opening, 2.5" Base. Wooden base is NOT Included. 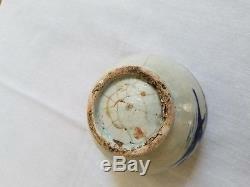 The item "Yi Dynasty Blue and White Jar Landscape and Flower Cobalt images" is in sale since Wednesday, September 13, 2017. 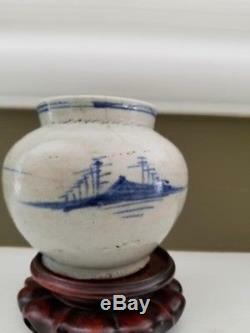 This item is in the category "Antiques\Asian Antiques\Korea". 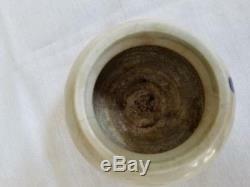 The seller is "connieschwartz" and is located in Lawrenceville, Georgia. This item can be shipped worldwide.